The post-mortems and prognostications began just minutes after Wisconsin Governor Scott Walker's recall election victory, and they're still flooding in. His win, goes one talking point, bodes well for Mitt Romney's efforts to flip Wisconsin red for the first time since 1984. Bummed-out Democrats, suggests another, spell trouble for President Obama in November. Obama's got no reason to worry, claims a third, because 17% of the Walker recall vote came from Wisconsinites who claim they will go the president's way in the fall. Such futurology is now the essence of what we think of as political coverage (along with the flood of opinion polls that make it seem like realism). Yet such crystal-ball-reading is a fool's errand. Gubernatorial recalls in particular are utter rarities, outliers brought into being by a unique set of local circumstances. You can bet on one thing, though: Walker's win has emboldened the Republican Party. And here's another likelihood: Republican governors and state legislators nationwide will emulate Walker's "divide and conquer" agenda -- his own words -- in the months and possibly years ahead. Tim Phillips, president of the conservative group Americans for Prosperity, said as much in Wisconsin on the eve of the recall: "Today every other governor in the country and every state legislator in the country is watching Wisconsin. Because the Wisconsin approach to changing and making state government better is the new model for the country." Behold the Walker model: Kneecap public-employee unions; slash government spending for education and services for the poor and elderly; lower corporate taxes; implement controversial -- and potentially discriminatory -- voter identification legislation; redraw your state's political boundaries to benefit the GOP (and then wait for the election contributions to pour in by the multimillions from enthused right-wing billionaires and corporate "individuals," with a blitz of the airwaves to follow). The revelers watched in stunned disbelief, cocktails in hand, dressed for a night to remember. On the big-screen TV a headline screamed in crimson red: "Projected Winner: Scott Walker." It was 8:49 p.m. In parts of Milwaukee, people learned that news networks had declared Wisconsin's governor the winner while still in line to cast their votes. At the election night party for Walker's opponent, Milwaukee Mayor Tom Barrett, supporters talked and cried and ordered more drinks. Barrett soon took the stage to concede, then waded into the crowd where a distraught woman slapped him in the face. 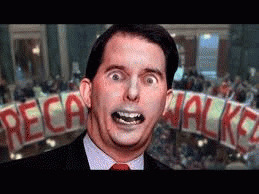 Walker is the first governor in American history to win a recall election. His lieutenant governor, Rebecca Kleefisch, dispatched her recall challenger no less decisively. So, too, did three Republican state senators in their recall elections. Democrats avoided a GOP sweep with a win in the sixth and final senate recall vote of the season, in Wisconsin's southeastern 21st district, but that was small consolation. Put simply, Democrats and labor unions got rolled. The results of Tuesday's elections are being heralded as the death of public-employee unions, if not the death of organized labor itself. Tuesday's results are also seen as the final chapter in the story of the populist uprising that burst into life last year in the state capital of Madison. The Cheddar Revolution, so the argument goes, was buried in a mountain of ballots. But that burial ceremony may prove premature. Most of the conclusions of the last few days, left and right, are likely wrong. The energy of the Wisconsin uprising was never electoral. The movement's mistake: letting itself be channeled solely into traditional politics, into the usual box of uninspired candidates and the usual line-up of debates, primaries, and general elections. The uprising was too broad and diverse to fit electoral politics comfortably. You can't play a symphony with a single instrument. Nor can you funnel the energy and outrage of a popular movement into a single race, behind a single well-worn candidate, at a time when all the money in the world from corporate "individuals" and right-wing billionaires is pouring into races like the Walker recall. Colin Millard, an organizer at the International Brotherhood of Bridge, Structural, Ornamental, and Reinforcing Iron Workers, admitted as much on the eve of the recall. We were standing inside his storefront office in the small town of Horicon, Wisconsin. It was night outside. "The moment you start a recall," he told me, "you're playing their game by their rules." The uprising began with Colin Millard. The date was February 11, 2011, when Walker "dropped the bomb," as he later put it, with his "budget repair" bill, which sought to gut collective bargaining rights for most public-employee unions. Later that day, a state Democratic Party staffer who knew Millard called him and pleaded with him to organize a protest. Millard agreed, even though other unions, including the AFL-CIO, urged him to back out. Don't make a fuss, they advised. Let's call some lawmakers and urge them to oppose Walker's bill. "f*ck off," was Millard's response.